Lecture on J-SCORE ; title is [ It is just water, but it is really water] (2018/12/22) in Tokyo. Many engineeers, scientists and bachelor of literature praised the contents and asked many question earnestly. It was successful meeting indeed. 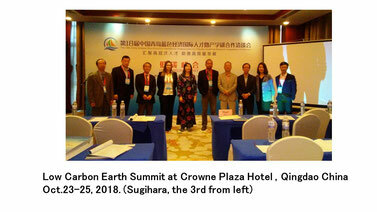 Recent manuscript ; "Model for Transmutation of Elements using Weak Energy of Water Leading to Faster Disintegration of Radionuclides"
The 8th Annual Low-- Carbon Earth Summit-- CROWN PLAZA HOTEL in Quigdao,China (2018/1024);I lectured ”How can we reduce air pollution resulting in clean environment with a weak energy of water"
Thank you for your interest to my water (SIGN water ) by people from Germany, French, China, Thailand and Japan, 8th of March, 2018 (Osaka ). "water science and application " , it was so good experience although too short. energy-related materials (electronic ceramics in particular), which S-rist provides.